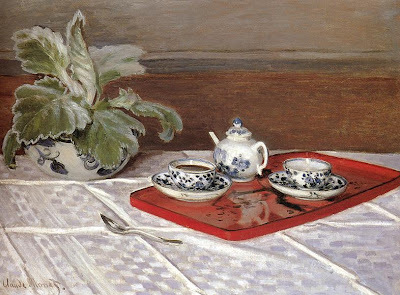 It is Claude Monet's birthday today, so why not take tea with him. I found this recipe for Madeleines in "The Easiest Way in Housekeeping and Cooking Adapted to Domestic Use or Study in Classes" by Helen Campbell. Madeleines.—Four ounces of butter, four ounces of the best flour, three ounces of sugar, a teaspoonful of orange-flower water, the yolks of four eggs, and rind of a lemon. Beat butter, sugar, and yolks of eggs together, then add the other ingredients; grate in the rind of half a lemon, and add the well-beaten whites of eggs last of all. Fill little moulds that have been buttered with washed butter, cover the tops with split almonds and sifted sugar; bake from thirty to forty minutes in a moderate oven. These cakes are sometimes served hot with apricot sauce. Rub to a cream six ounces of sugar, with six ounces of butter, add two well beaten eggs and work in twelve ounces flour, adding a teaspoonful of rose water. Roll out thin and cut into small cakes. 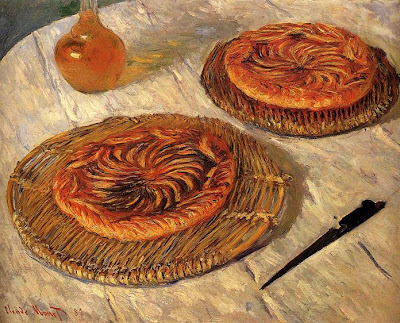 If you still are hungry I suggest you make a galette. There are quite a few recipes on the web, this is one of them. And don't forget the flowers! Gosh darn it that guy could paint..you can feel the textures with your eyes...if that doesn't sound too silly. I agree - I sat for very long and looked at the damask table-cloth - I know how hard it is to get a decent photo of a white cloth. Oh well, I don't say it is easier to paint one - unless you are Monet. How interesting that you know what Shrewsbury cakes are - I've never heard of them before. Perhaps I should make a batch. 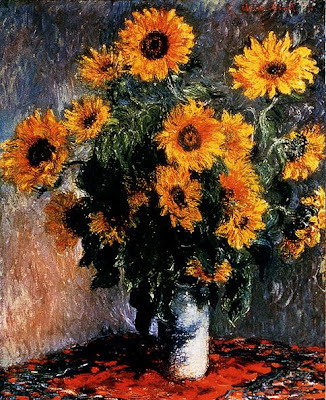 I didn't know it was Monet's birthday. I have a wonderful cookbook Monet's Table which has many photos from his home and family history from his grandson. It's so beautiful. He made his home and table as beautiful as his paintings. The author talked about what a hard time he gave the house painter until the man found the right shade of green that satisfied Monet. What a job that poor house painter had! A customer who knew exactly what he wanted! I have borrowed that book from the library many years ago, I remember I thought it was a beautiful book. I have one called Proust's Table - so I believe there are several books on that theme. I guess it always is hard to work for someone in the same profession, like having a patient that is a physician or a teacher's child in your class. I'm glad you wrote as it makes it easier for me to continue to blog when I have an idea about who the readers are. My gosh, don't those teacups look real. Oh, to be able to paint like that!